Two sets of parents meet to resolve an incident between their young sons, but the more time they spend together, the more they realise they are at odds with one another. Carnage is a claustrophobic look at the relationships between strangers, the secrets we think we are hiding and how alliances are formed and discarded. Penelope (Jodie Foster) and Michael (John C. Reilly) are the parents of the ‘victim’ of the attack and Nancy (Kate Winslet) and Alan (Christoph Waltz) are the parents of the child who hit the other with a stick. At first, their meeting is cordial, but as time goes on, tensions rise and all pretence of niceness is lost. It would be easy to assume that the alliances are only between the married couples, but bonds are formed and lost quickly through everyone’s childish behaviour. Kate Winslet’s performance as a seemingly patient and reasonable woman quickly changes to that of into an impatient person, who believes that this meeting to resolve a conflict between children is pointless. Jodie Foster as Penelope is a tightly wound woman who – on the surface – is open and liberal. Underneath the surface, Penelope is at breaking point with her husband, and very clearly does not approve of the way that the other couple are raising their child. At first, she tries to control her guests, but as she finds things in the wrong place in the house, her anger quickly turns to her husband and the world at large. John C. Reilly as Michael – Penelope’s husband – tries to act as mediator, but ends up frustrating his wife with his ‘calm’ attitude. Add to this, Christoph Waltz’s Alan who is constantly on the phone and appears to care very little about the outcome of the meeting and it is only a matter of time before an amicable meeting turns sour. Each of the performances are beautifully directed, with the slightest glance or shift in position leading to a change of alliance. The atmosphere is claustrophobic from the start, but fast wit lighten the tone at regular intervals, to help the audience to deal with what could be seen as the dissolution of two marriages. Everything said is a bone of contention to someone, and it seems the only outcome of such an intense meeting is the end of all alliances. Alan and Nancy try to leave the situation more than once, only to find themselves sucked back in by the offer of coffee or a well-timed barb. The tension quickly rises, and it is Nancy who breaks it, by vomiting all over the coffee table. As Alan and Nancy clean up in the bathroom, Penelope and Michael are briefly united, but it is not long before each couple manipulates one another and push buttons to chip away at the front they have put up. Even as they destroy each other, they destroy themselves, but they are so intent on getting one up on someone… anyone, they seem unaware that this destruction is mutually assured. With the possible exception of Penelope, all of the characters do not hold any firm alliance or standpoint, as the discussion rolls, so do their allegiances. Roman Polanski directs the film fantastically. Although all of the action is set within one apartment, he uses the space to his advantage and allows the characters to orbit around one another. Their positioning in the apartment generally signifies their position in any one argument, and Polanski allows characters to emerge into the foreground, and then fade as the dispute rolls on. As well as the staging, Polanski has coaxed great performances from his actors; this is a piece that examines the logical outcome of passive-aggression and as the adults gang up on one another, their anger rises and falls, depending on what side of the argument they are on – and how much whiskey they have had to drink. 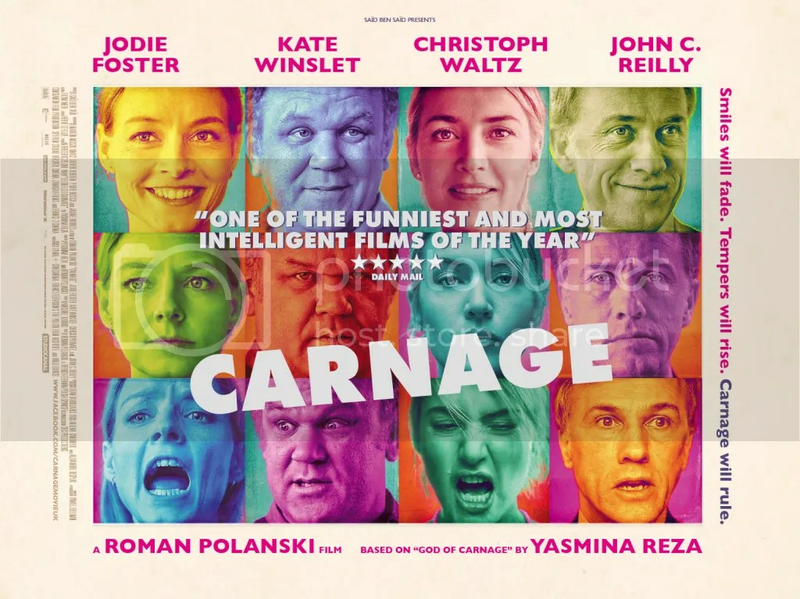 The one complaint could be that Carnage is billed as a comedy. While there are moments of razor sharp wit within the film – and I defy anyone not to laugh and the vomit scene – this film is more of a tragedy; these characters have created lives for themselves, but hate every second of their existence. They are trapped, but afraid to move on and the only weapon they have in their arsenal is resentment. Carnage is a snapshot of one afternoon in a Brooklyn apartment, but it is an examination of how relationships are made and broken. Secrets that the characters believe hidden are plain for others to see, insecurities attacked and battle lines drawn. Polanski has created a bleak film (with moments of levity), with performances that are subtle and brilliant with no one actor taking centre stage over another.